We spent an afternoon at The National Audubon Society’s Corkscrew Swamp Sanctuary, justly famous for its birds and its beauty. Being the slowest time of the day, the birds were not much in evidence, but there is beauty aplenty all along the 2.25 miles of boardwalk. We did see a few birds. 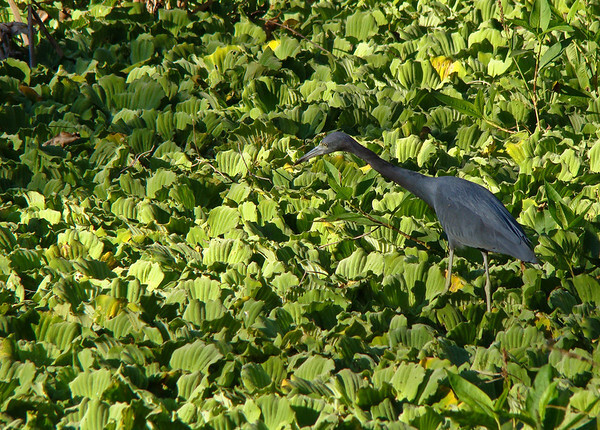 This Little Blue Heron is feeding on one of the smaller lettuce lakes (a pond really), and I really liked the contrast of the blues and magentas of the bird against the crisp greens of the lettuce. I took several shots as the bird was moving rapidly and I wanted to catch an interesting pose. Sony DSC H50 at its full telephoto (465mm equiv.). F4.5 @1/400th @ ISO 400. Programed Auto. Cropped slightly in Lightroom at the bottom to bring the bird to the third lines (he was moving too fast for perfect composition and I wanted the pose). Sharpen Landscape preset, and small amounts of Clarity and Vibrance. From the Sanibel and Everglades Gallery.